Blind Date showed off just as much as Eichendorff with a double victory in Stadl-Paura. In the Grand Prix qualifier for the Freestyle, she decisively won with 74.86 percent. 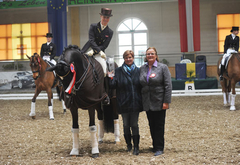 And she was also sovereign in the Freestyle with 78.00 percent. Second place went to Jessica von Bredow-Werndl/GER on Zaire (73.25 percent), followed by Stefanie Weihermüller on Fantomas IV (72.97) and Matthias Bouten with Söhnlein Brillant MJ (72.35). For Austria, Astrid Neumayer and Rodriguez took sixth place, Timna Zach with Quantico Platz seventh, Christian Schumach with Auheim’s Picardo Rang eighth and Nikolaus Erdmann with Lamborghini Rang ninth. Stadl-Paura was the first show in the qualification period for the Olympic Games 2016 in Rio de Janeiro/BRA. So I am delighted about the four victories of Eichendorff and Blind Date. And I must give the highest praise to the organizers of the show, the Beudl and Neumayer families, and their time-tested and experienced team. After the terrible storm that blew the stable tents away, the horses could be boarded in stables in the shortest amount of time. That was only possible thanks to outstanding teamwork – and the riders were very grateful!! I'd also like to take this opportunity to thank my team! Without them it would not have been so easy to prepare at home and participate at the show. Thank you so much for your great support!! !